Irish Blue Terrier | Kerry Blue Terrier Dog | A Feisty And Entertaining Dog Breed! The Irish Blue Terrier, also known as the Kerry Blue Terrier dog, is the national dog breed of Ireland. He is a good-humored fellow as you might well imagine, but not without a dose of pepper in his personality! The breed origins can be traced back over a hundred years to the Kerry Mountain region in Ireland where they were used as a general working dog. Their skills range from hunting and retrieving both on land and water, to guarding the flocks and the homestead. Likely breeding stock included the Bedlington and the Bull Terrier. It is a very sturdy and well-balanced looking dog with unmistakable Terrier characteristics. It has a full and beautiful dark coat and a dominant square-shaped head. The Irish Blue Terrier, as he is known in Ireland, is very charismatic, smart and bold. He is an affectionate and loyal dog to his entire family - not a one person dog. Like most terriers, he is confident and independent, except in his case, these traits are more dominant. These terriers need strong owners who can unequivocally establish their leadership. Otherwise, they may end up with a boisterous dog that can be a handful. Training needs to be challenging and creative to hold their attention. Early socialization is recommended to balance their protective traits and potential dog-aggressiveness. An ideal owner should have a sense of humor, be firm and fair in training, but not domineering, and enjoy a challenge of wits with this clever canine. This is not a dull dog! Single coated, soft and silky, though very plentiful and quite dense. It does need to be brushed, combed and bathed regularly. However shedding is minimal and the Kerry is considered to be a hypoallergenic dog breed. It also has little to no odor. To keep up on routine maintenance, a slicker brush and metal combs are basic necessities. These will help avoid the dreaded matting and tangling for which this lush coat is prone to, if neglected. A grooming table will also make the job a lot easier on the back! Tools we like as a starting point for everyday upkeep are the Wahl Combination Double Row Pet Rake along with a buttercomb to glide through the coat like - well butter! Although this comb might seem a little pricey, it's amazing and just the ticket for doing-no-harm to the Kerry's thick locks - also happens to be what the pros use! If you come across any difficult areas while brushing or combing, a small amount of spray-on detangler is helpul to the process. Grooming is an important priority in owning a Kerry Blue Terrier to his coat healthy and prevent it from becoming matted. While salon visits are usually needed to maintain the unique cut, home care can defer the need for pro help. So in summary, to keep up with the basic needs, routine care consists of cleaning wipes to the bearded area to remove food residue and dirt; frequent brushing and combing and a monthly bath. The Irish Blue Terrier is quite an active dog that enjoys long walks, vigorous games and definitely some mental stimulation. A toy invented by neuroscientists that will test your terrier's intelligence is the CleverPet Hub. It will engross him in all day play as he is challenged to solve puzzles with this unique toy. Perfect for smart dogs! With sufficient exercise, the Kerry Blue dog adapts well to either house or apartment, though there is no doubt that a fenced yard would be useful. 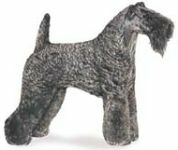 The Irish Blue Terrier is very playful and seems to have a natural affinity with children. Although they are patient and gentle with kids, their sometimes rambunctious behavior may make them better pals for bigger children. As always, when it comes to interaction between pets and children - no matter what the breed - activities should be supervised by an adult. Elderly or more sedentary owners would most likely find this breed more dog than they need! Covers breed history, description, grooming, selection, nutrition, housetraining, general health care, breeding, and owner responsibility. A good resource for the novice or someone considering the breed. Good color photos. On All Aspects Of Pet Care!